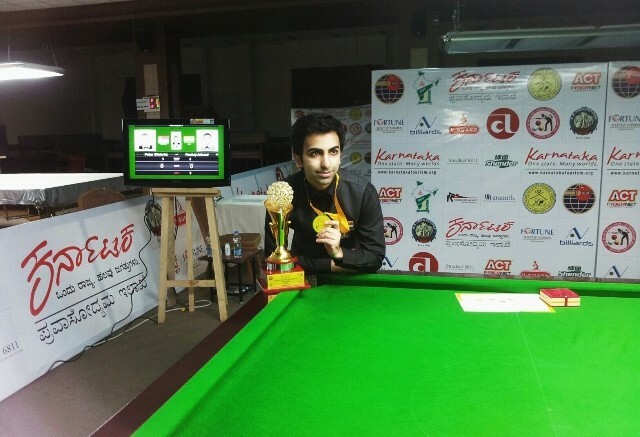 BENGALURU: India cue sport ace Pankaj Advani annexed another world crown here on Monday. In winning his 12th IBSF billiards title, the Karnataka cueist won a mind-boggling 16th crown overall in all formats of the sport. In the points format final, Advani defeated Peter Gilchrist of Singapore by six frames to three at the KSBA indoor hall here. It was a few days back that the Singaporean had won the long up format (time format) defeating another India’s ace cueist Sourav Kothari. Thus Advani not only denied Gilchrist a grand double crown but ensured the title stayed with an Indian. Despite two best players of the game competing in the final, there were only two century breaks, one each by the duo. In the semifinals, Advani ousted Myanmar’s Aung Htay by five frames to nil while Gilchrist outplayed India’s Davaj Haria 5-1. The results: Final: Pankaj Advani (India) bt Peter Gilchrist (Singapore) 6-3 (151 (98)-33, 150 (97)-95, 124 (65) -151 (112), 101 (98)-150 (89), 150 (87)-50, 152-37, 86 (86)-150, 151 (110)-104, 150 (88)-15. Semifinals: Peter Gilchrist (Singapore) bt Dhvaj Haria (India) 5-1 (151 (151)-05, 87-151, 151-118, 151-33, 150 (150)-11, 150 (99)-28); Pankaj Advani (India) bt Aung Htay (Myanmar) 5-0 (150 (101)-55, 150-08, 152 (122)-129, 150 (117)-18, 150 (142)-79).